Pratt Institute’s Manhattan Gallery is hosting a chronological exhibition of the work of three 20th-century designers whose careers spanned most of the modernist era. The roughly two-month-long show covers the work of Anni Albers, Elaine Lustig Cohen, and Rosmarie Tissi, three designers whose lives crossed paths with famous men but who were successful in their own right. 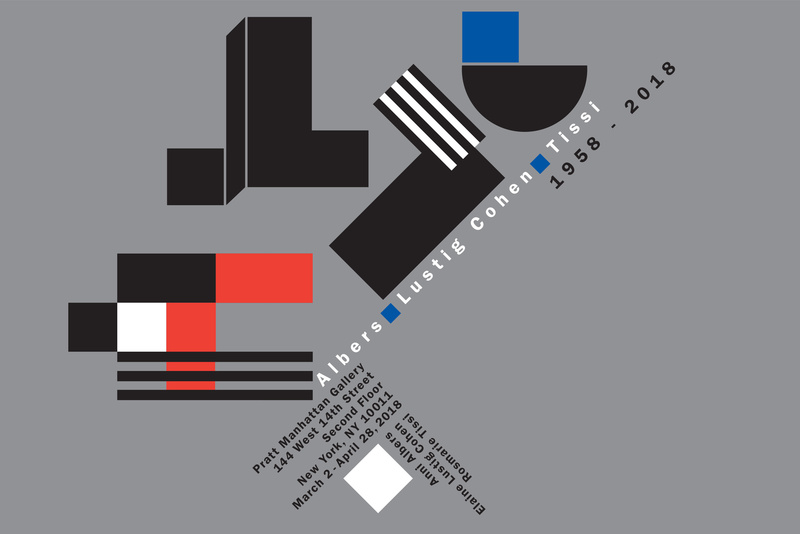 In chronological order, Albers, Lustig Cohen, Tissi, 1958-2018 highlights typography, prints, sculptures, books, paintings, and more from the three practitioners, who tended to produce highly geometric forms across media. Lustig Cohen learned graphic design from Alvin Lustig, her first husband, who would dictate his ideas to her after he lost his sight. She did the typography for Philip Johnson’s Seagram Building, and is known for her large geometric paintings from the 1970s. Albers, meanwhile, was an influential textile designer for the Bauhaus, and later emigrated to the United States, where she taught at the Black Mountain School (1933-49). Though many may know her as the wife of artist and educator Josef Albers, she was the first designer ever to get a solo show at MoMA, in 1949. Tissi is the only surviving member of the group. She founded O&T (Odermatt & Tissi), her eponymous studio with Siegfried Odermatt, in 1968, and she is still in practice today. Tissi designed the poster for the show, pictured at top. Albers, Lustig Cohen, Tissi, 1958-2018, which runs from March 2 to April 28, is curated by graphic designer Phillip Niemeyer, who also directs Northern-Southern, a gallery and art agency in Austin, Texas. An opening reception is scheduled for March 1 from 6 p.m.–8 p.m.; more information on the exhibition can be found here.